Kim has a great tutorial for dressing up your front porch for Fall with this cute DIY pumpkin topiary. I am also madly in love with her hanging Fall wreath that she will be sharing the tutorial for soon!! 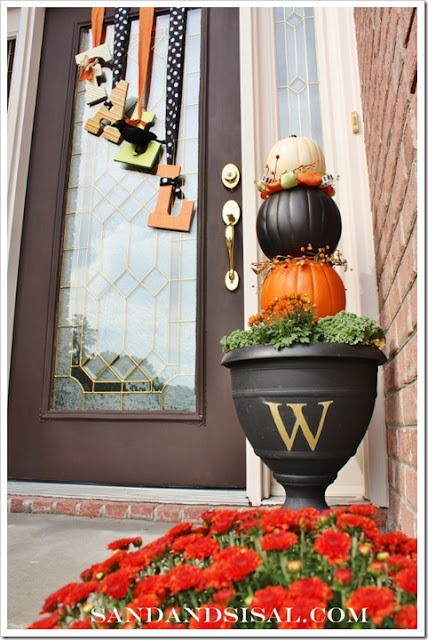 If you are more of a Halloween decorator than Fall, both of these fun projects could easily be spookified too. I see a BOO hanging from my frond door in the near future! You can check out how to make your own DIY pumpkin topiary over at Sand and Sisal. Thanks for featuring it Lorie! A pumpkin topiary! What a great idea!! It would be cute to set up and then spookify as Halloween gets closer. I'd love it if you checked out the homemade autumn decor on my blog!